Capture and analyze signals, the easy way. IKALOGIC builds logic analyzers and portable oscilloscopes that are perfectly adapted to firmware engineers, embedded designers and makers. 9-Channels, 200MSPS logic analyzer with embedded 2Gb sampling memory and industrial bus receivers. Starting from 349€ Excl. Taxes. Capture logic signals and analyze I2C, SPI, CAN, RS232, 1-Wire, and 30 more protocols. Starting from 299€ Excl. Taxes. 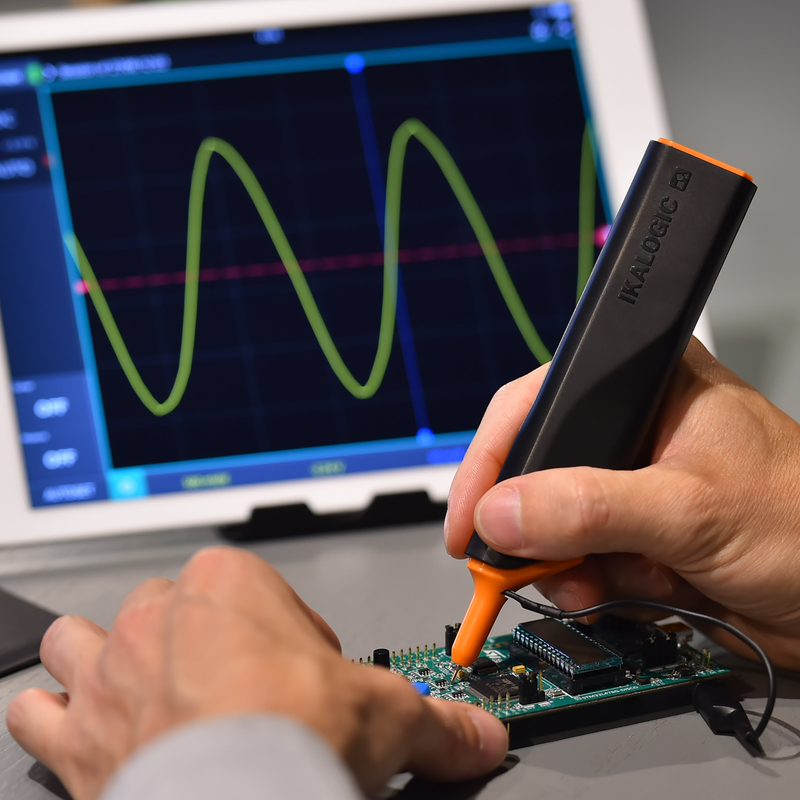 IkaScope is a new kind of instrument: It's a full featured oscilloscope fitted inside a WiFi connected probe. IkaScope takes no extra space on your desk and follows you everywhere with a 1-week battery life. It connects to your computer, smartphone or tablet to display captured signals. At Ikalogic, we believe quality software can impact your productivity. We have designed ScanaStudio software to capture and perform in-depth analysis of logic signals. It works with all our logic analyzers, it's free, it's regularly maintained, and it runs on Windows, Mac or Linux. With ScanaStudio, smoothly ride through trillions of samples, analyze your protocol and fix your most tenacious bugs! Are your products CE, FCC and RoHS certified? Yes, all Ikalogic products are CE/FCC/RoHS certified. Certificates can be provided on request. Yes. We offer 3-Years warranty on all our products. Can I speak to someone from Ikalogic team if I need to? Sure, just give us a call on +33(0) 555 358 028. We speak French and English and answer your calls from 9 am to 6 pm (France local time). If you're not physically far from us, you can even pass by our office - just give us a message beforehand. Where can I get software and drivers? Software and manuals are only available online, to ensure you always get the latest version and to reduce our impact on the planet! Please check the product page to find all software related to a product. Also, check the knowledge base section at the bottom of this site for full up-to-date manuals. Can you help me with a device I didn't buy directly from Ikalogic? We will provide all the technical support you need, regardless of where you bought your Ikalogic products. However, for sales related questions, please contact the distributor you bought the product from. If for some reason you feel like our product is not the right fit for you, just drop us a mail and return it back: We'll reimburse you the full amount including shipping fees.